Arepa (Spanish pronunciation: [aˈɾepa]) is a type of food made of ground maize dough, originating from pre-Columbian northern region of South America, and is notable in the cuisines of Colombia and Venezuela. It is eaten daily in those countries and can be served with accompaniments such as cheese, cuajada (fermented milk), various meats, chicken, avocado, and diablito. It can also be split to make sandwiches. Sizes, maize types, and added ingredients vary its preparation. Arepas can also be found in the Canary Islands. It is similar in shape to the Mexican gordita and the Salvadoran pupusa. The arepa is a pre-Columbian dish from the area that is now Colombia and Venezuela. Instruments used to make flour for the arepas, and the clay slabs on which they were cooked, were often found at archaeological sites in the area. Although it has not been specified in which country an arepa was cooked for the first time, it has been possible to define the oldest dates of the presence of maize in Colombia and in Venezuela. For example, In Colombia, the first record of the existence of corn dates from about 3,000 years ago, while in Venezuela the estimate is about 2,800 years ago. In other words, the creation of the arepa most likely happened almost simultaneously in both countries, but in a time that each territory was far from becoming two countries with demarcated borders. Throughout its history, the arepa has stayed mainly unchanged from the arepas that pre-Columbian native peoples would have consumed, making the arepa one of the few pre-contact traditions that have remained popular in the years since colonization. The arepa is a flat, round, unleavened patty of soaked, ground kernels of maize, or—more frequently nowadays—maize meal or maize flour that can be grilled, baked, fried, boiled or steamed. The characteristics vary by color, flavor, size, and the food with which it may be stuffed, depending on the region. It can be topped or filled with meat, eggs, tomatoes, salad, cheese, shrimp, or fish depending on the meal. The flour is mixed with water and salt, and occasionally oil, butter, eggs, and/or milk. Because the flour is already cooked, the blend forms into patties easily. After being kneaded and formed, the patties are fried, grilled, or baked. This production of maize is unusual for not using the nixtamalization (alkali cooking) process to remove the pericarp of the kernels. This makes arepa flour different from masa flour, which is used to make tortillas. Arepa flour is specially prepared (cooked in water, then dried) for making arepas and other maize dough-based dishes, such as hallacas, bollos, tamales, empanadas and chicha. The flour may be called masarepa, masa de arepa, masa al instante, or harina precocida. The most popular brand names of maize flour are Harina PAN, Harina Juana, and Goya in Venezuela, and Areparina in Colombia. The arepa is an iconic food in Colombia, with some 75 distinct forms of preparation. According to a study conducted by the Colombian Academy of Gastronomy, "The arepa is part of our cultural heritage and can be considered a symbol of national gastronomic unity." In 2006, the arepa was named the cultural symbol of Colombia in a competition organized by Semana magazine with support from Caracol TV, the Minister of Culture and Colombia is Passion. In the Paisa Region, the arepa is especially important to the local people and accompanies some times all meals of the day. In addition, arepas are strung into necklaces and placed around the necks of honored dignitaries as a sign of praise. In Colombia, the arepa is sold on a commercial level in neighborhood stores, chain supermarkets and market plazas and packaged with preservatives as a pre-molded white or yellow corn dough that is ready to grill or fry at home. It is also sold in the form of industrialized corn flour that requires hydration before preparation. 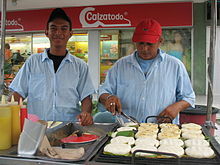 In addition, arepas are sold by street vendors, in cafeterias, and in neighborhood stores. Restaurants of the Paisa Region offer a wide variety of arepas, including a unique style of stuffed arepa that can be filled with eggs, meat, or cheese. The Colombian Arepa Festival is celebrated in the following five major cities: Bogotá, Medellín, Cali, Barranquilla, and Bucaramanga. According to the program calendar, each city takes turns organizing the festival between the months of August and December. The arepa is a symbol of Venezuelan gastronomy and one of the most common pre-Hispanic foods still popular in Venezuela. In Venezuela, there are different brands of precooked corn flour. Some of these brands are Juana, Demasa, CASA, Venezuela and Flour National Food Product (PAN Flour). The latter has become a generic name for all maize flours in the country given the phenomenon of the vulgarized brand. In 1960, Empresas Polar, under the slogan "¡La piladera ran out!" Launches the PAN flour Flour precooked corn, obtained thanks to the procedure developed by the Venezuelan mechanical engineer Luis Alberto Caballero Mejías, 33 34 that represented a important alternative to avoid the long process of making arepas with a pylon. The arepas can be cooked in four different ways: roasted, baked, boiled and fried. Another way to make arepas is using a Tosty Arepa, an appliance that, like precooked corn flour, revolutionized the way in which the arepas were prepared and reduced the preparation time.28 27 The Tosty Arepa is a creation of The company Oster de Venezuela, which dates back to 1989, has since been transformed into more modern and efficient models. According to a 2015 survey of the Venezuelan people, nearly 70 percent of the nation ate arepas on a regular basis. It is common for Venezuelans to eat arepas throughout the day, both as snacks and as sides to meals, creating a culture where these corn products can be found almost everywhere. The arepa is seen as a cornerstone of a Venezuelan diet, and in a good financial year, the average Venezuelan consumes about 30 kilos of the corn flour used to make the arepas. Venezuelan arepas are commonly filled with a great variety of different fillings, from beef and avocado to yellow cheese, varying widely by the location of where they are sold and the ingredients that can be obtained. Since the 2015 food shortages began, the consumption of arepas has severely decreased. These shortages have caused the citizens of Venezuela to be unable to get enough basic food supplies, including the corn flour used to make arepas. The consumption of the corn flour per capita have decreased from 30 kilos per year in 2014 to 17.5 in 2016. These shortages have caused some to say that the arepa is dying in Venezuela. Venezuelan citizens who want to buy corn flour in order to make arepas must wait in lines for hours to receive government price-regulated corn flour, or they must purchase for much more in the black markets. ^ Gilbert G. Gonzalez; Raul A. Fernandez; Vivian Price; David Smith; Linda Trinh Võ (2 August 2004). Labor Versus Empire: Race, Gender, Migration. Routledge. pp. 142–. ISBN 978-1-135-93528-3. ^ "Arepas". whats4eats. Retrieved 17 May 2012. ^ "Arepas". picapica. Archived from the original on 16 July 2016. Retrieved 16 September 2016. ^ Lovera, Patricia Sulbarán (2017). "¿De dónde es la arepa realmente: venezolana o colombiana?". BBC Mundo. Retrieved 2017-10-24. ^ a b c d e "Arepas Are Conquering The World — But Dying At Home In Venezuela". NPR.org. Retrieved 2017-10-24. ^ "Bon Appetit | Recipes & Menu Ideas". Bon Appetit. Condé Nast. September 2014. ^ a b Blazes, Marian. "Masarepa - Precooked Corn Flour for Making Arepas". About Food. Retrieved July 8, 2015. ^ a b c Revista Semana. "La arepa". Retrieved 11 January 2011. ^ Gamba, Raúl Ricardo; Caro, Carlos Andrés; Martínez, Olga Lucía; Moretti, Ana Florencia; Giannuzzi, Leda; De Antoni, Graciela Liliana; Peláez, Angela León (17 October 2016). "Antifungal effect of kefir fermented milk and shelf life improvement of corn arepas". 235: 85–92. doi:10.1016/j.ijfoodmicro.2016.06.038. ^ Hernandez, Blanca; Guerra, Marisa; Rivers, Francisco (1999). "Obtención y caracterización de harinas compuestas de endospermo–germen de maíz y su uso en la preparación de arepas". 19 (2): 194–198. doi:10.1590/S0101-20611999000200007. ISSN 0101-2061. ^ Winchester, Elizabeth (2014-09-26). "What's Cooking?". Time for Kids (Grades 5-6). Vol. 5 no. 3. p. 7. ^ a b c d Agropecuaria, Vision (2016-11-22). "Venezolanos consumen 12,5 kilos menos de harina de maíz precocida al año - Visión Agropecuaria". Visión Agropecuaria (in Spanish). Retrieved 2017-10-24. ^ "How Venezuelan Traditions Work". Traditional Venezuelan Food - How Venezuelan Traditions Work | HowStuffWorks. 2011-07-25. Retrieved 2017-10-24. ^ Reuters (2015-08-07). "Looters target Venezuelan food stores as shortages spark frustration". The Guardian. ISSN 0261-3077. Retrieved 2017-10-24.